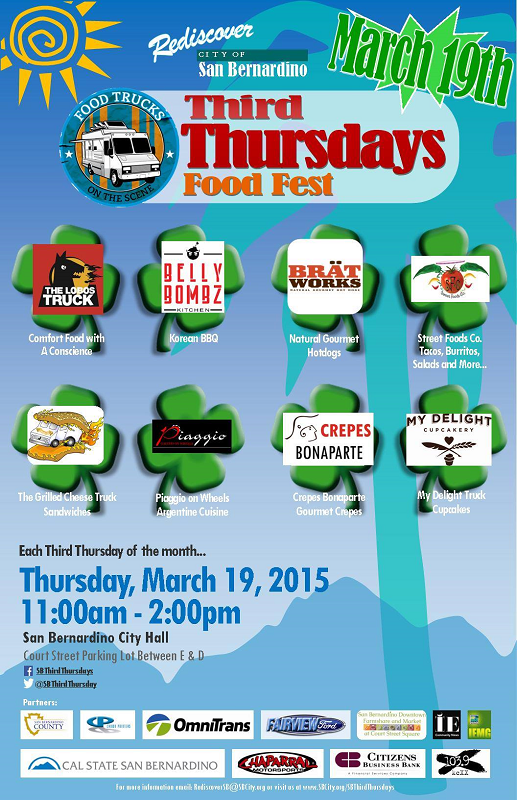 Tomorrow (March 19) is the return of the popular downtown San Bernardino Third Thursdays Food Fest, and this month’s lineup features some new trucks. 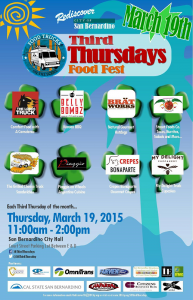 Joining for the first time are the Lobos Truck, Belly BombZ and San Bernardino-based Brätworks. Returning are Crepes Bonaparte, the Grilled Cheese Truck, My Delight Cupcakery, Piaggio on Wheels, and Street Foods Co.
Attendees will receive a free sbX ride voucher with a meal purchase from any of the trucks. Dairy Queen is celebrating its 75th “Fanniversary” by giving away small vanilla cones at participating locations today (March 16). The chain is also collecting donations for Childrens Miracle Network Hospitals. 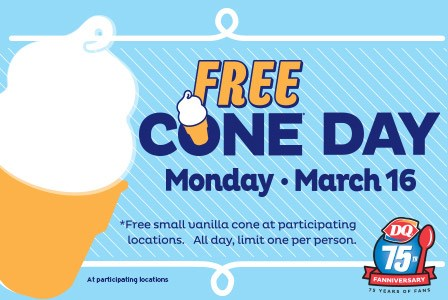 Inland Empire Dairy Queen locations include Ontario, Colton, Redlands, Rancho Cucamonga, Bloomington, Rialto, Chino Hills, Montclair, Yucaipa, San Dimas, Riverside, Moreno Valley, Norco, Murrieta, Hemet, Lake Elsinore, Palm Springs, Temecula, Ludlow, Baker, Anza, Bermuda Dunes, Yermo and Needles. Saturday (March 14) is Pi Day, and the city of Claremont is again celebrating the day with the Claremont Pie Festival. The event features pie baking and eating contests, pie making demos, pie tastings, a vintage apron exhibit, a pie recipe card hunt, kids’ apron decorating and an apron parade, along with classic cars, live music and vendor booths. The festival will take place from 11 a.m. to 4 p.m. in the Village. Headquarters for the festival is the I Like Pie Bake Shop, 175 N. Indian Hill Blvd., naturally. Click here for more information and contest forms. We’ve been watching construction going on at the former Elephant Bar at 1050 E. Harriman Place in San Bernardino and had figured out it was going to be Jiro’s Japanese Restaurant, but then San Bernardino Sun reporter Ryan Hagen came along and filled in the blanks for us. 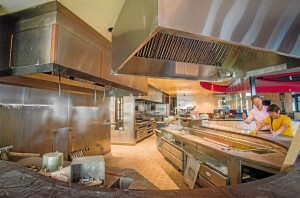 The new restaurant is expected to open in May. We’re thinking it should do well, since there hasn’t been a Japanese restaurant in the Hospitality Lane area since Yamazato of Japan closed in December 2008. And, no, we’re not counting Seattle’s Best Teriyaki. Fontana’s Tio’s Mexican Grill, 16953 Sierra Lakes Parkway, just went upscale with the addition of Tio’s Grille & Cantina next door. The new place — which had its grand opening on Saturday — looks amazing! It’s truly a family affair, as the owners’ niece, who operates designstiles, created the look. You can check out the pics (from Sabra Lattos Photography) here. 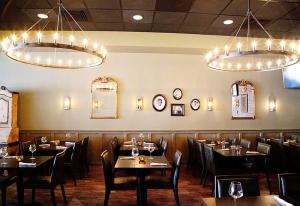 Reservations are now being taken for the latest Let’s Dine Out Show Grub Club event. Allen Borgen and crew will host diners at Domenico’s Italian Kitchen, 890 Oak Valley Parkway in Beaumont. The event is scheduled to take place from 4 to 7 p.m. March 8. Participants will sample 14 different dishes, including four different pizzas. Cost is $42 per person, which includes tax, tip and a non-alcoholic beverage. For more information, including a full menu, click here. 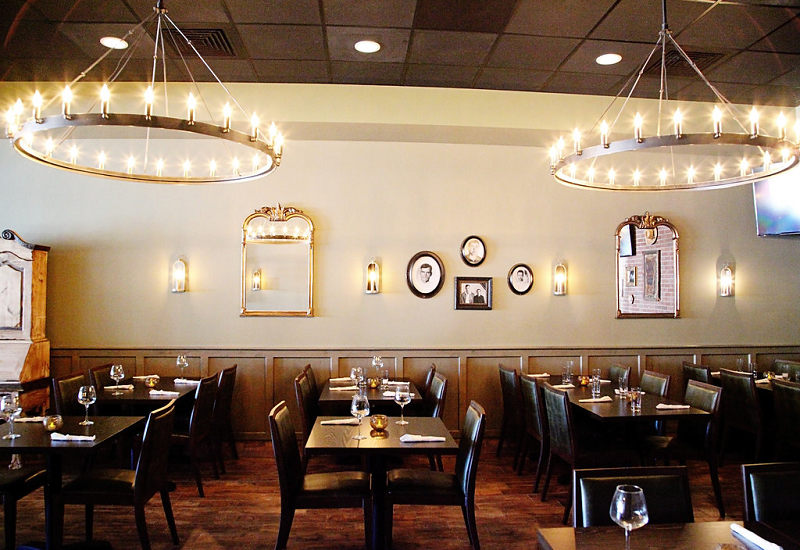 To make a reservation, click here.